The I-Wrench series of the Cleco brand consists of hand-held screw systems for safety-critical screw connections. They are inserted after the screw has been screwed-in, in order to apply a high tightening torque and to achieve the clamping force required for the specific application. 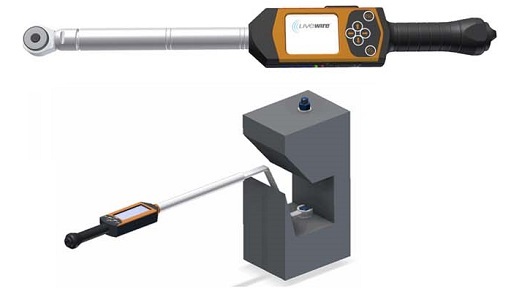 The torque measuring range varies between 1.5-15 and 120-1200 Nm in ten stages. A touch screen display and additional control knobs are available for selecting stored parameter sets or manually setting the target value. The visual user guidance provides the operator with 5 colored LEDs with rising warning signals and additional vibration and sound signals for feedback on the tightening process and a final IO/NIO evaluation. The strain gages of a strain gauge on the torsion bar or torque and angle of rotation continuously detected with an angle sensor are continuously displayed and can be transmitted to an mPro400GC controller, an industrial PC or a wireless network. Interfaces are a USB interface, WiFi or Bluetooth. Barcode scanners are optional. I-Wrench hand-held tools are versatile tightening systems for supervised manual screw mounting. Typical applications are hand-held torque and / or rotation angle-controlled tightening methods with safety-critical screw connections. Users are found in the automotive and automotive supply industry and in other industries.